The Primacoustic Honeycombs™ are a range of acoustic absorbers that are designed to give users more aesthetic options in their rooms. Rather than being limited to the typical square and rectangular panels found in most studios, the hexagonal shape and beveled edges allow the panels to be installed in unique patterns and clusters. Now primary reflections and flutter echo can be controlled with an acoustic treatment layout that is personalized to your space. The 16″ (406 mm) Honeycombs are 1.5″ (38 mm) thick, and are constructed from 6lb high density glass wool for optimal broadband absorption. As with all Primacoustic panels, the Honeycombs have been tested to achieve stringent Class-A fire ratings, making them safe for use in installations worldwide. 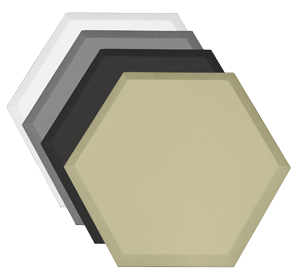 The Honeycomb absorbers are available in black, grey or beige Broadway™ acoustic fabric, or in Primacoustic’s proprietary Paintables™ white finish. The Honeycombs will start shipping in March 2017.